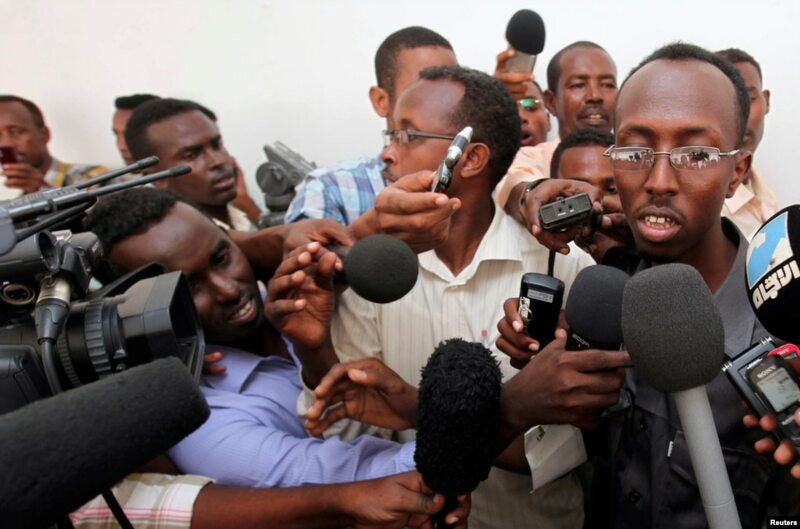 FILE - Somali journalist Abdiaziz Abdinur (R) talks to reporters after the high court freed him in the capital of Mogadishu, March 17, 2013. Experience has taught Somali journalist Mohamed Hassan how to spot a suicide bomber, which neighborhoods to avoid and how to cope with the loss of colleagues - his own brother was killed. Although Islamist militias were driven from Mogadishu about two years ago and media are flourishing as never before, those lessons are just as relevant in what is one of the world's most dangerous cities for journalists or anyone else. In more than two decades of conflict, last year was the deadliest on record for journalists in Somalia, with 18 killed, according to the National Union of Somali Journalists. It blames lax security during a year of political transition, when Islamist militants carried out revenge attacks after their al-Shabaab fighters were driven out by African peacekeepers. Journalists have been among the victims since Somalia descended into war in the early 1990s. Three Reuters journalists were lynched by Somalis in 1993 as they covered an ill-fated U.S. intervention. There is no clear record of how many have been killed in the past two decades, but the union of journalists said the death toll since 2005 was 50. Hundreds of thousands of Somalis have died during two decades of war, anarchy and famine. The continuing dangers have not deterred Somali journalists as al-Shabaab's departure has spurred a media revival. Mogadishu's residents now have a choice of about six daily newspapers, nine television channels and 23 radio stations. Those are double the numbers that were around when al-Shabaab held power. Radio stations that operated then often did so from outside Islamist held areas. Somalis now listen to shows on issues ranging from sport to personal relationships, topics banned under the codes of al-Shabaab. Journalists write openly about divisions within the ranks of al-Shabaab and even hint - cautiously - at rifts over policy within the new government. “They're kind of reinventing themselves based on what they see on satellite television - their standards, their approach, grafted onto Somali society,” said Andy Hill, a former Reuters journalist. He was in Mogadishu in 1993 when his colleagues were killed, and he now trains Somali journalists. Six years ago, Islamists stormed his radio station and ordered him to broadcast a call for Jihad against the government of the time. The choice was almost certain death if he refused or the government's wrath if it was played. He aired it. “I was like a lump of meat roasted on both sides,” he said. Hassan's brother, Farah Hassan, a radio journalist, was shot in 2011 by unidentified snipers when African peacekeeping forces were driving al -Shabaab out of Mogadishu. He had stayed back in the radio station to work during the fighting. 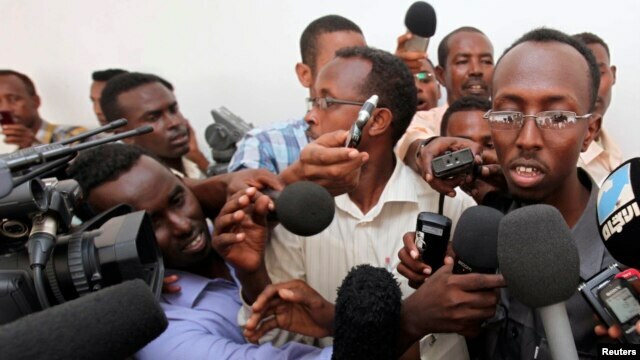 As the turmoil has abated, the number of journalists in Mogadishu has grown. There are now about 300 journalists in Mogadishu compared to about 100 in 2007, according to the union. “A free press gives citizens pride in their country, creates a spirit of involvement and a desire for education that uplifts everyone,” said Kathy Eldon, mother of Reuters photographer Dan Eldon, who was killed in Somalia in 1993. She now campaigns to help others around the world use the media to highlight humanitarian and other issues, as her son did. Eldon was killed on July 12, 1993 with Hos Maina and Anthony Maina, both of Reuters, and Hansi Kraus, of the Associated Press, when a mob took revenge after a U.S. helicopter gunship attacked a compound of Somali warlord Mohamed Farah Aideed. Dozens of Somalis were killed in the U.S. strike. Somalia is still a fractured state where the new federal government has limited control beyond the boundaries of Mogadishu. Islamist militants, who control swathes of countryside, still carry out bombings and shootings in the capital. Underlining the continuing threat to the media, a television journalist was shot dead on July 7 by unknown assailants in Somalia's Puntland region. They fired four to six bullets into his body, the journalists' union said. “I have my own special measures to protect myself,” said 27-year-old freelance journalist Abdalle Mumin, who is particularly cautious about when and where he ventures out. “It's a tough place to be a journalist,” he said.